← Faith, not Fear: Can God Get an “Amen!”? 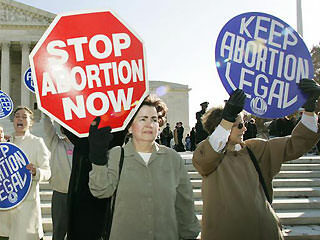 40 Years of Roe v. Wade… Lord Come! 40 years of Roe v. Wade! That’s what it’s been since the landmark US Supreme Court decision Roe v. Wade which gave women the right to choose abortion and terminate the unborn life of their baby child. This blog isn’t a judgment on those mothers, many of whom are now living with great regret over their decision. They need as much grace as the rest of us sinners, myself included. And I believe the blood of Jesus Christ is more than able to wash away those sins just as it is able to wash away my sins. This blog is about the injustice of abortion killing of the unborn human lives. But before you read any further, please don’t assume that I am just another Evangelical Christian riling against abortion while oblivious to the other ways in which societies commit atrocities of injustice against other human life. I am not. I have published blog posts which speak out against war-making, mistreatment of the poor, and other injustices and evils. But I do regard abortion as evil and just as evil of an act as those committed by terrorists flying planes into buildings full of innocent civilians or military personnel dropping an A-bomb on a city full of innocent civilians. What makes abortion wrong is that it is the killing of a human life. And if you don’t believe that an unborn fetus is a human life, you need to be in the room during an ultrasound on a pregnant mother. To say otherwise is to say that it is external conditions which determine what is life and what is not (which opens up a massive pandora’s box). Nevertheless, it is ok in America to kill the life of the unborn since the rights of a woman to choose outweigh the right to life of unborn children. The irony of this reasons is related to the current debate on gun control, the 2nd amendment, and mass gun violence. As most people know, President Obama supports legislation that places more regulation on gun ownership and restrictions on military grade assault weapons (a cause I support). Apparently, if I understand the President correctly, his reason for supporting such legislation has to do with his belief that the safety of the lives of children’s lives is greater than the 2nd amendment right to bear arms. But this logic, which I also agree with, does not get applied equally to the rights of unborn children. Consequently, while the right of life trumps the right to bear arms, the right of life does not trump the the right to choose. That seems just a bit incoherent. The problem is that neither the woman nor anyone else is “the boss.” That is, no human is “God” with the right to decide which human life is of value and which life is not. While this woman, and many others, wants to stop well short of going where the Nazis did in justifying “the final solution” because they regarded Jewish people as sub-human, her reasoning is where such madness begins. For whenever we can decide that one life or one category of human life — be it an ethnic group, an age group, or whatever classification status we choose — is of less value than other human life then eventually we will find a way to justify devaluing and even terminating whatever category of human life hinders our individual objectives. That’s what is done by the war-makers of our world and that’s what is done by those champion abortion as a moral and legal practice. Don’t believe me yet? Back in January of 2011 in the city of Philadelphia, Dr. Kermit Gosnell was arrested and is now facing charges of murder for running a million dollar abortion practice. 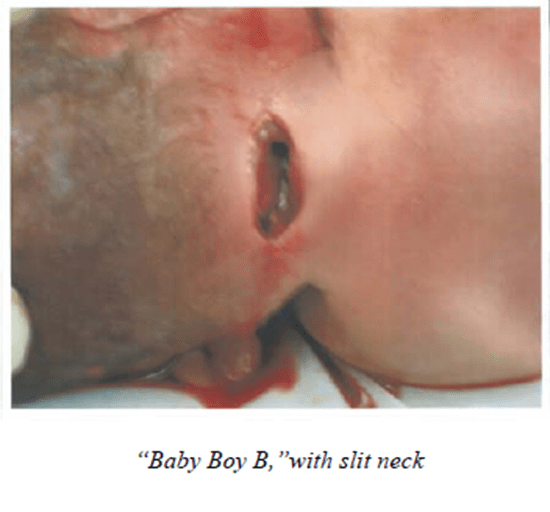 His practice alledgedly resulted in not only the death of at least one patient but also some live, post-birth abortions in which he supposedly used scissors to cut the spinal-cord of a baby at the base of the neck. The results are what you see in the photo. You can watch an even more graphic video about this story here. While even most pro-choice advocates would probably deem the events and horrors surrounding this story as morally repugnant, what Dr. Gosnell did likely only happens in a society that legalizes and champions the practice of abortion. When does it end? When does the killing stop? How much longer will this madness be praised as the freedom of choice in a civil society such as America? Because there’s nothing civil or just about the practice of abortion in America! My guess is that change will only happen when we begin to see each life as both human being made in the image of God. One thing I know… When Jesus comes again, these babies will receive the justice they have been denied, they will receive a life where there is no more pain and no more people who decide their life was disposable. Lord, come! Next week I plan to write about the Christian response to abortion addressing what we must do in addition to expressing our moral indignation. In the meantime, feel free to comment if you life and agree or disagree if you like but be courteous or be deleted.